When you think about it, an event like Comic Con should come as no shock to anyone. Whether we care to admit it or not, we all harbor a need to feel special. For many of us science fiction and comic books provided an escape from everyday sameness, allowing us to imagine ourselves as a superhero or starship captain. It seems only natural that their popularity would eventually spawn huge conventions where fans could gather to express their appreciation for the genre. 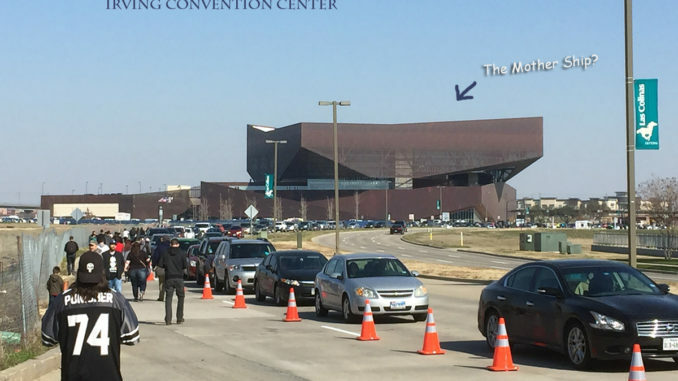 We made the trek to the Irving Convention Center to experience this phenomenon first hand. By the time we arrived on Saturday morning, the Centers parking lot was full and we were directed to a distant parking garage. The long walk provided a tantalizing glimpse of what the rest of the day would show us. Throngs of comic book fans costumed to the max representing their favorite fictional character strutted along feeding off the stares they received. Like a pilgrimage, the crowd converged on the vaguely mushroom-shaped building that housed the Comic Con event. Along the route we spotted a small group of protesters who appeared to have an issue with the event. Their concern seemed to be religious in nature, but the harangues they directed at the crowd were delivered by a megaphone that produced little more than a fuzzy approximation of human speech. 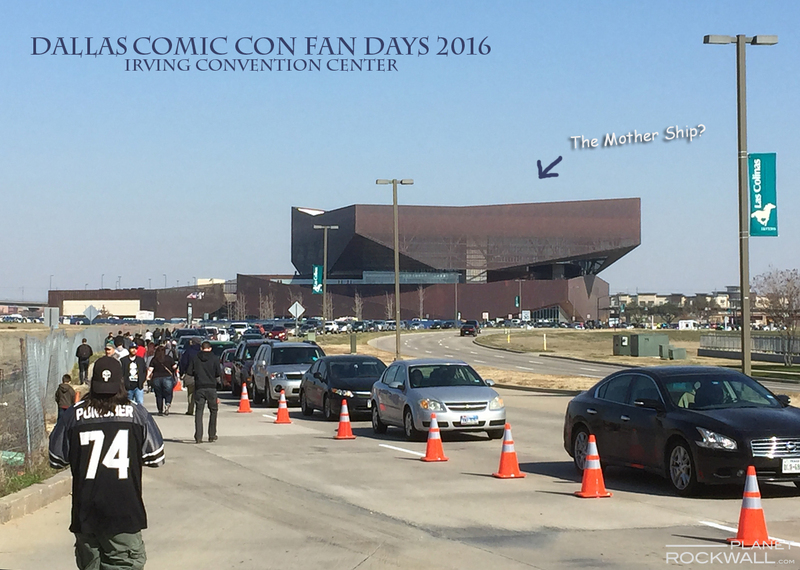 We marched onward to the mother ship, ready to cross over into the parallel dimension that is Dallas Comic Con. First on our agenda was a Q & A session with Brent Spiner, better known to fans of Star Trek: The Next Generation as the android Data. Mr. Spiner has had a prolific career in film, TV and on Broadway, quite outside his Star Trek appearances. He described his experience auditioning for Data as a little frustrating. The shows producers wanted the part to be played like a robot, whereas Spiner was intrigued by the possibilities of having Data explore aspects of humanity, such as emotion. Fortunately for fans the latter concept won out, giving the character a complexity that stands to this day as one of the most unique of its genre. 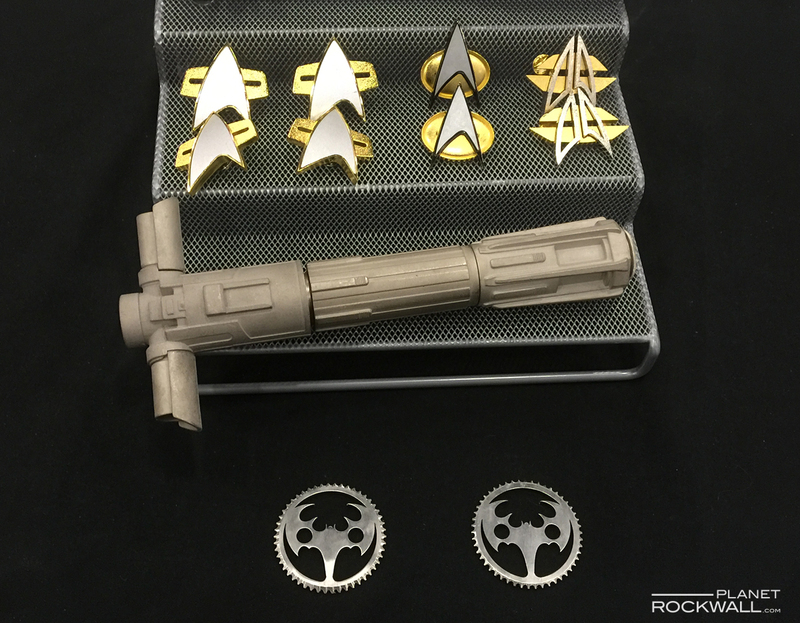 Next up was a visit to the cosplay rooms. Cosplay, or “Costume Play,” is a form of performance art which gives participants a chance to dress up and act out their favorite fantasy characters. We found ourselves surrounded by Batmen, Supermen, Thors, Darth Vaders, the list goes on. One costume, Groot from the movie Guardians of the Galaxy, included a pair of stilts that gave the character a ten-foot stature, at the very least. Also very much in evidence was Marvel Comics new antihero, Deadpool, which is currently breaking box office records in movie theaters. 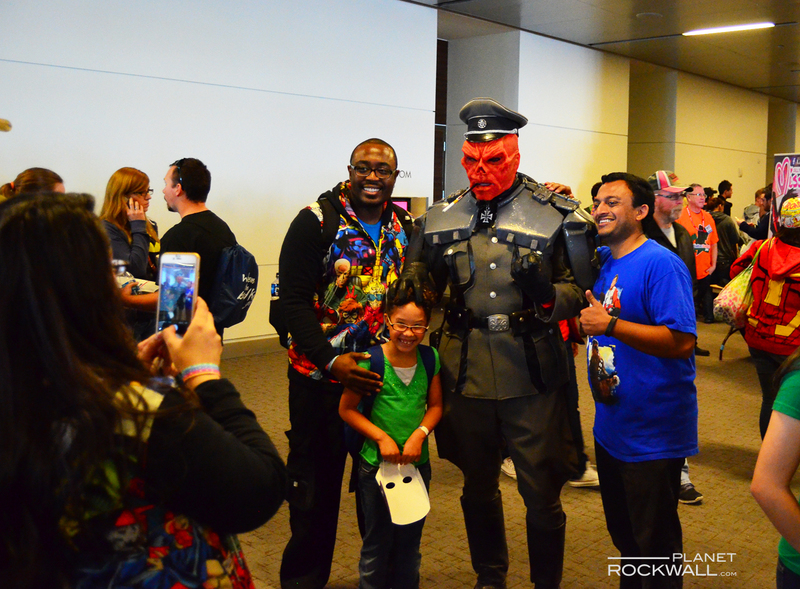 The most dramatic costumed character making the rounds at Comic Con was Red Skull, the archenemy of Captain America. Selfie hounds had to gather a bit of courage to ask the supervillain for a pose. All this cosplay activity made the next event all the more intriguing. Most of us are familiar with Speed Dating, in which participants are given a few minutes time with each of about 30 potential love matches in rapid succession. After these encounters, one presumably finds one or two persons of interest for follow up. Unclear to this observer, however, was how one was to make a decision on whether someone shrouded from head to toe in Star Wars storm trooper armor, including full face-covering helmet, was going to be a future soul mate. Many celebrities from comic book page and screen were on hand for autographs and selfies. 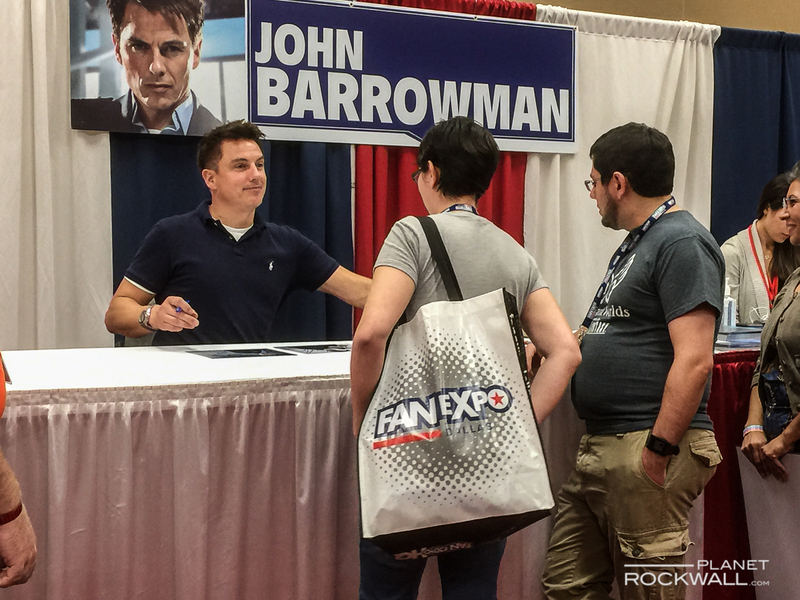 A big draw was John Barrowman, whose popularity on the Doctor Who series as Captain Jack Harkness earned a spinoff series on BBC, Torchwood. The cast of The Dukes of Hazzard: John Schneider, Tom Wopat and Catherine Bach were also there along with their car, the General Lee. The Fox TV series Gotham had fans lined up to meet the young Bruce Wayne (David Mazouz) and butler Alfred (Sean Pertwee). 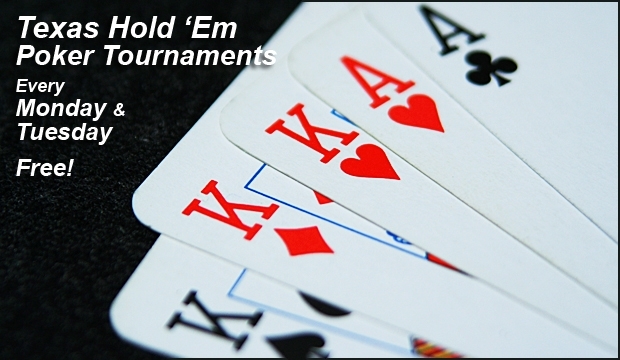 Visitors were provided ample opportunity to gather souvenirs of the event. An entire floor was dedicated to merchandise such as t-shirts, action figures, swords, costumes, artwork and, of course, comic books. It all seemed like good, harmless fun to me. I had hoped to find out what the protesters were concerned about, but they had given up and gone home by the time we left. Or maybe they decided to come on in and do a little speed dating.